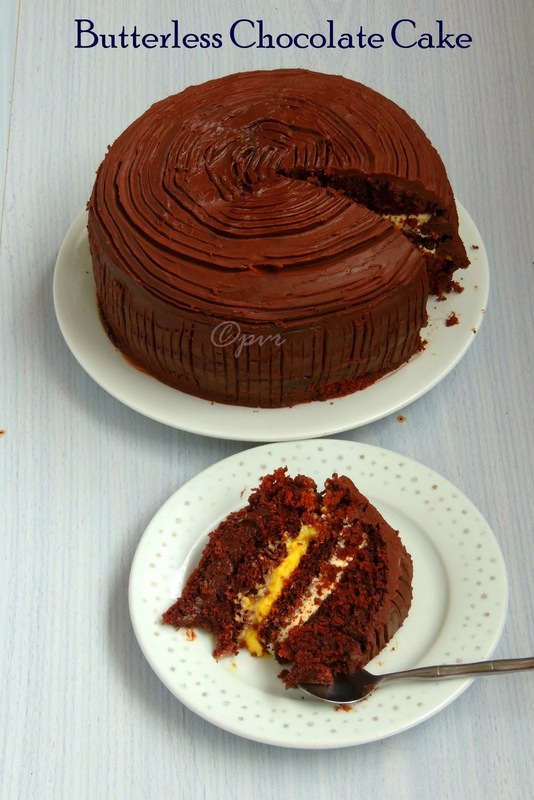 This chocolate cake need loads of patience, you cant make them just like that in a day, get ready with the filling before a day and bake the cakes next day, as this cake need two chocolate cakes.Or else start baking your cake earlier in morning,followed by the filling and assemble your cake later in the evening. This cake suits simply awesome for a party or for a special occasion. 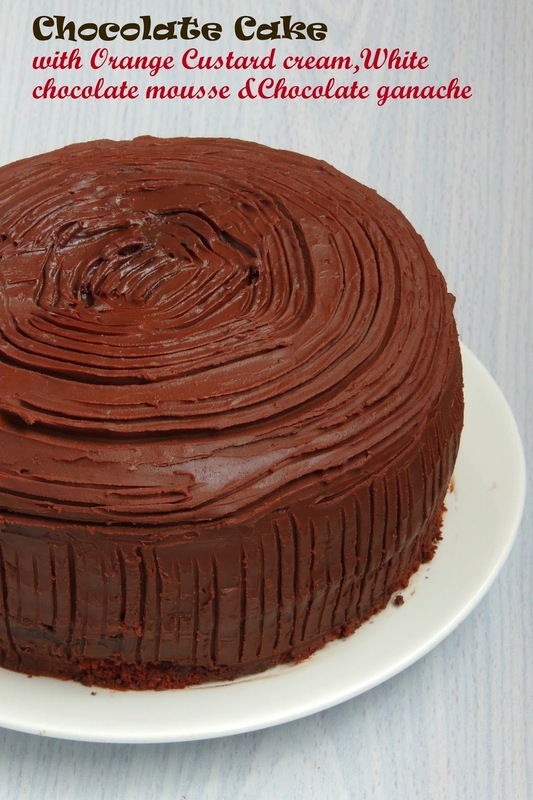 Since its going to be a special day for me in two days, i baked this cake bit earlier to celebrate the day with this rich decadent chocolate cake. Preheat the oven to 350F, grease two 8inch round baking pan generously with butter. Beat together the eggs and sugar until the mixture turns fluffy and pale. Meanwhile sieve the flour, cocao powder, baking powder, baking soda twice and keep aside. Now add the oil and yogurt to the egg mixture and beat everything for a while. Finally add in the vanilla essence, give a stir. Gradually add the dry ingredients and stir with a whisker until everything gets mixed. Pour the mixture to the already prepared pans equally, bake for 30-35minutes until a tooth pick inserted comes out clean. Remove the cakes from the pan, and let it cool completely. Wrap the cakes and keep in fridge for atleast three hours or even overnight. Take the white chocolate bar, orange juice in a microwave safe bowl. Heat it for a minutes, remove the bowl and mix well, heat again for 30seconds. Remove the bowl, add in the orange zest and whisk well. Whisk the whipping cream for few minutes, add the sugar and beat in medium high speed until stiff peaks forms. Now fold in the cooled white chocolate mixture to the whipped cream and arrange in fridge until assembling. Heat the orange juice in a vessel, add the vanilla custard powder, whisk well until the mixture turns thick, remove the vessel from the fire. Add the now add the butter, orange zest whisk everything well. Strain this mixture to remove the orange zest. Add in the cream, whisk everything well and let it cool completely, wrap it and arrange in fridge until use. Bring boil the heavy cream,add immediately the chopped dark chocolate pieces,,mix well and until you get a shiny thick chocolate sauce, remove it from the flame. Whisk for a while,now add the butter and mix well, arrange this ganache in fridge for atleast an hour. Unwrap the cakes and slice the cakes into two, place a layer of cake in a plate or cake board, now add half of the chocolate ganache and spread it over the cake. Now place the another layer, add the orange custard cream generously, spread it over the cake. Place the another layer, add the white chocolate mouse and spread it evenly over the cake. Now place the final layer of the cake and make sure the sides of the cakes are well aligned. Start spreading the ganache on the sides, once the sides are done, cover completely the top of the cake. Smooth as much as possible, remove the excess og the ganache, with a fork make marks on the cake. Arrange the cake in fridge for two hours. Once nicely chilled, slice the cake as per need. 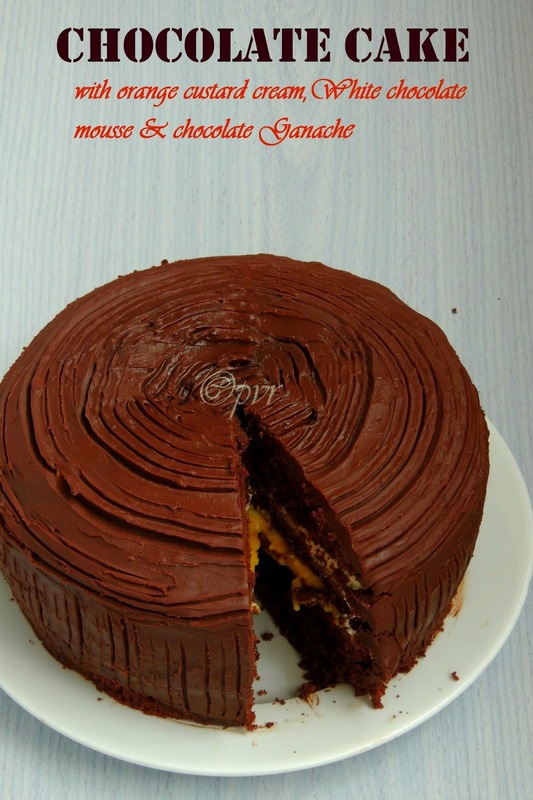 This cake is a slice of Heaven, who can resist to this fantabulous cake with beautiful filling. 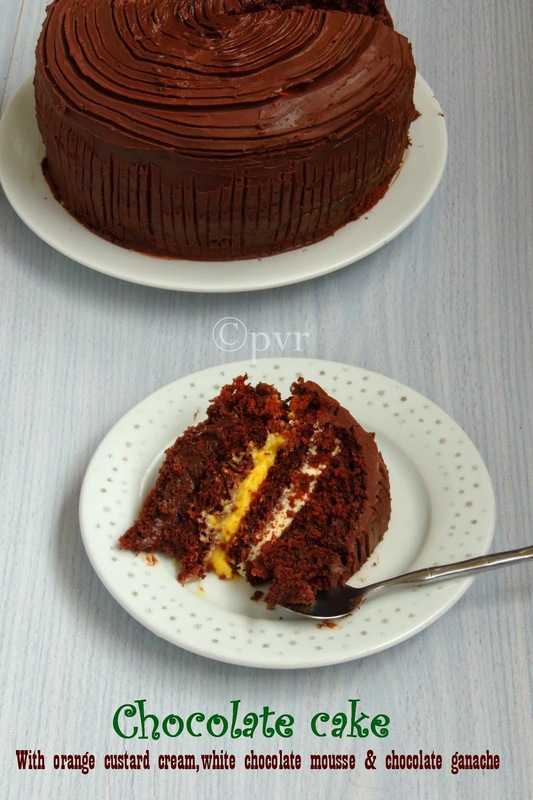 Chocolate cake looks awesome, indeed a slice of heaven!!! Wow! Super delicious cake. such a visual treat here..loving it. Truly a piece of heaven!!! Looks so chocolicious!!! Im inlove with the fillings! I want to try this one once all my desserts are finished! yummm!!! I want a slice of that!! or rather leave you one slice and take the rest for myself ;). saw it on one of the FB groups..this is absolutely yummy....I have bookmarked this recipe. Will make it for my 3 yr old nephew who is coming on vacation in Diwali to India. He loves oranges and chocolate..drooling over the pics..
a slice of heaven.... that's so true. Looks like a perfect dessert treat. Looks stunning priya..I was hoping it to be eggless as well..:(..anyway you have done it so beautifully! Fabulous cake dear....... Beautifully presented!! Awesome cake Priya, it looks stunning, lovely clicks! 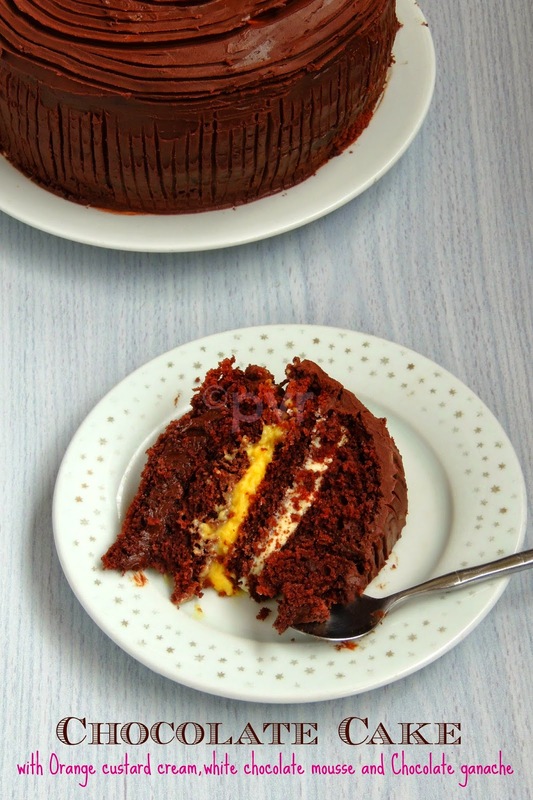 such a delicious cake with 2 fillings, love it!!! I enjoyed reading ur posts...i miss baking cakes now..the fillings are so interesting. wonderful cake with lovely filling..wish to have some pieces!! well.its worth all the effort. Just luk at the cake...am drooiling all over the picture. I always leave hungry from your space...you making me drool again with this awesome cake..